Featuring more than 300 exquisite pieces, Cartier: The Exhibition brings the glitterati up close and personal. From royal style to Hollywood glamour, the exhibition was co-curated by Margaret Young-Sánchez, formerly of Denver Art Museum and Simeran Maxwell, NGA Curator of International Art, along with the NGA team. Designed by internationally-renowned scenographer Nathalie Crinière, Cartier: The Exhibition features three favourites of Her Majesty The Queen, from her personal collection. Additional unprecedented loans come from and have been facilitated by: the Smithsonian Institute; Qatar Museums Authority; the Victoria & Albert Museum; the Royal Collection Trust, Her Majesty Queen Elizabeth II’s personal collection; the Princely Palace of Monaco; Grainger Museum, University of Melbourne; Arts Centre, Melbourne; Parliamentary Art Collection, Canberra; National Museum of Peles Castle, Sinaia, Romania; Musée des arts décoratifs, Paris; multiple private lenders. 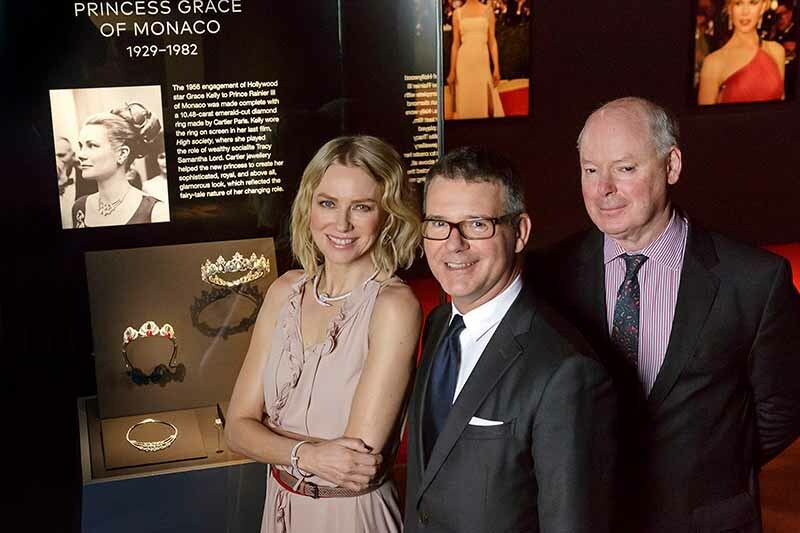 Cartier: The Exhibition includes the tiara loaned to Catherine Middleton on her wedding day by Her Majesty The Queen, Grace Kelly’s engagement ring and Elizabeth Taylor’s ruby and diamond necklace, along with some of the most exquisite pieces from the stunning Cartier Collection. Featuring more than 300 works of art, the exhibition showcases outstanding necklaces, brooches, tiaras, watches and ornaments, alongside rarely seen archival drawings, photographs and ephemera. Co-curated by Margaret Young-Sánchez, formerly Chief Curator of Denver Art Museum and the NGA, the exhibition showcases pieces from the Cartier Collection, museums, institutions and private collectors. A remarkable Royal Style section features items generously lent by Her Majesty The Queen, including a brooch with one of the most impressive pink diamonds in the world, jewellery worn and owned by Princess Margaret and Queen Elizabeth The Queen Mother, and the famous Indian Tiara owned by The Duchess of Gloucester. Cartier’s legacy is synonymous with clients like the Duchess of Windsor, Princess Grace of Monaco, Mexican film star María Félix, and the indomitable queen of jewellery, Elizabeth Taylor. The greatest Australian celebrity at the turn of the 20th century, Dame Nellie Melba—a devoted Cartier client—is also a feature of the exhibition. RCOD 227-X14 HM Queen Elizabeth II. Obligatory Credit – CAMERA PRESS / Baron. SPECIAL PRICE APPLIES. British monarch HM Queen Elizabeth II pictured in 1953, on the small staircase of the Grand Entrance of Buckingham Palace, wearing a yellow tulle evening gown decorated with sprays of mimosa and gold paillette. Her Majesty is also wearing the blue mantle (ribbon) of the Order of the Star of the Garter; her necklace is a wedding present from the Nizam of Hyderabad.. The priceless Cartier necklacewas a wedding present in 1947 from the Nizam of Hyderabad, a king in India.